I'm a 56 year old construction worker who lives in a rural county to the west of Richmond, VA. I'm married with a daughter, 30, 2 sons, 18 and 14 and a step-son, 26. I sell on auction sites to supplement my income. The construction business has all but come to a halt. The merchandise I sell is priced at wholesale or just above wholesale. I pride myself on customer satisfaction, whether at my regular job, hanging sheetrock, or selling merchandise online. I pride myself on integrity and honesty. Take a look around and check me out. Many jewelry and clothing items will require sizes and the sizes needed must be stated upon checkout, or default sizes will be shipped. Default sizes are the average sizes, sizes that the majority would wear. Examples: rings- 7 to 8", bracelets- 6 to 7 1/2", shirts- medium, coats- large, etc! Please remember to leave a note in the order as to the size you need! If a size isn't stated, I will attempt to contact you twice through bmail or email, and after no response after 2 attempted contacts, the default size will be shipped. Thank you! I will ship the cheapest possible way to save you as much money as I can. Other than jewelry, which will most times be a flat shipping fee, and if there is a shipping cost stated, it's not written in stone, so if you want it reduced, ask me and I'll do everything possible to reduce it. If the shipping fees come to more than what I have stated, I'll eat the cost above what is stated, and if it comes to less, I'll deduct that from the cost. Some items will be calculated upon completion of sale for true cost shipping. Costs stated are estimates. Some items will have an additional shipping fee of $3.00 to $4.00 for oversize package. Some swords I sell will be shipped in oversize packaging, but the $3.00 to $4.00 extra is already included in the shipping costs. Will ship UPS, USPS, and FedEx. Will ship internationally. No WEAPONRY items will be shipped outside the USA. Buyer responsible for shipping costs and any customs and tariff fees that might incur. Will ship most cost efficient way. Contact me for shipping costs for international shipments. There is a $5.95 handling fee for international shipments. About 50% of my items are drop shipped. I only drop ship through top rated drop ship companies that I put a lot of research into. I've never had any problems with any of the drop shippers I deal with. It rarely happens, but on occasion, an item listed in my booth will no longer be available through my supplier, in which case I'll make it up to you. I keep a close watch on this, but an item not available will slip through. If this happens, I will refund your money immediately plus $10.00 dollars for your trouble, or I will try to find it elsewhere for you even if it costs me more. I have faith in my drop shippers, and I guarantee everything I sell will be in stock, or you receive $10.00 as a good will gesture for your trouble and disappointment. Please don't let drop shipping discourage you from buying from me, as I guarantee everything with an out of stock reward. All drop shippers I deal with ships within 48 hours of order, so you don't have to wait a ridiculously amount of time for your merchandise. If it takes longer than 48 hours to ship, it will be stated on the item page and in the description. Some items are made upon order, Ex. 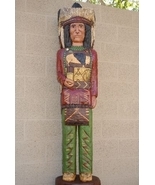 Carved Wooden Cigar Store Indians, metal Knights, and they may take up to 4 to 6 weeks to receive, but this will be stated in description. 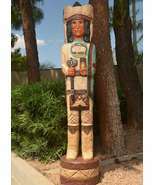 Wooden Carved Cigar Store Indians are shipped by motor freight and someone will have to be home on the scheduled delivery date to receive shipment. All items will ship in a timely fashion and will be well packaged. I give you my personal guarantee! I accept returns for up to 7 days of receipt of merchandise for a full refund. Merchandise must be returned in same packaging it was received in. If being returned for manufacturers defect or because of shipping damage, I will pay for return shipping. 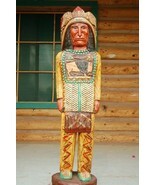 Custom made items, Cigar Store Indians, tin knights, belt buckles, etc;, no returns accepted. I accept Paypal, Amazon Payments, Money Order, Cashiers Check, and Personal Check. 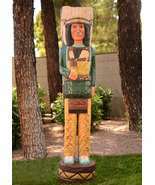 Cigar Store Indians and higher priced items MUST be paid for by PAYPAL or MONEY ORDER. No exceptions! Any merchandise paid for by personal check or money order will be shipped out upon clearance of check or money order. All other forms of payment will ship within 2 to 5 days. 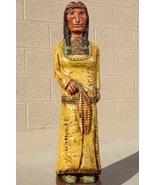 Many items in my booth are marked Native American made, and are made by Native Americans to the best of my knowledge. If it says Native American, then it will come with a Certificate of Authenticity to prove in fact that it was designed, hand made, painted, woven, etc, by an Native American from a Native American tribe. I market them the way my supplier markets them. Many items are also signed by the artist. 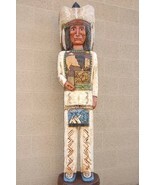 Rest assured that if it says Native American, it is 99.9% guaranteed to be Native American. 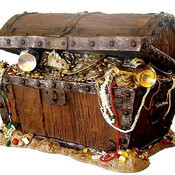 If you want something specific and can't find it, let me know, and I will try to find it for you. Prices listed can be negotiable, as they're not written in stone. If you see something you want, make me an offer, and I will try my best to give it to you for that price. Any reasonable offer not refused. I'm out to make a little extra money. I don't expect to get rich. Most items in my booth are new, unless otherwise stated. I very seldom sell used items, but on occasion, I do sell refurbished electronics, but they are refurbished by professionals and are just like new, with the same warranties that might come with a new product of the same. I refuse to sell anything that isn't of high quality. Some items in my booth will have a lifetime warranty, which will be stated in the description. If I wouldn't want it myself, I'm not going to sell it to someone else. Give me a chance and I'll do my best to be the best booth on Bonanza. Browse around and take a look. How thoughtful! Have a great day! Thank you for the welcome message! A refreshing change! Thanks for the welcome message. Best of luck in 2017! Thank you for the warm welcome message. Have a great weekend! Thanks for the welcome message! All the best to you! Thanks for the warm welcome. You have a very cool booth. Good luck in 2017 ! Thank you for giving me a welcome to Bonanza. I wish you the best of luck in this new year 2017. It is a nice surprise in the world that we live in to welcome sellers and people in general into the fold- thank you! Thanks for the warm welcome, that was so sweet. Thank you so much for the welcome! 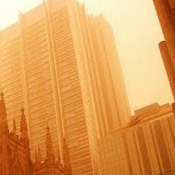 I am looking forward to sharing this marketplace with you. Thanks for the welcome – looking forward to lots of selling! I appreciate the warm welcome, Hope your store does well with all these new members. Thank you for the welcome to the bonanza world. I’m new here & hope to meet other sellers & sell my items as well. We are a family run business who make home decor items. Thanks & Good luck to you as well! Thank you for the welcome!!! you have really beautiful items in your booth!!! much health and prosperity to you!!!! Thanks! I’m excited to be part with you on Bonanza! Thank You for being so warm and inviting. Means the world. I’m new to bonanza and was happy to find a welcome note from chestoftreasures! ???? I will definitely look you up when I’m ready to buy. Best of luck!!! Very nice and accommodating seller! Wonderful hand picked merchandise. Very Nice Welcome! Thank-you! Hope to learn from you:) Keep in touch! Very friendly and very grateful for the super duper warm welcome! Good luck! We appreciate the warm welcome you offered ! Take care and happy selling…. Hey there! Thank you for reaching out at welcoming me! Have a wonderful weekend! Wow, thanks for welcoming me – a first! It appears you have considerable experience, so I may be able to learn by watching you. God bless you! Very Friendly Bonanzler! Thank you!!!! Thank you for your warm welcome. I appreciate it. Sent a warm welcome to Bonanza. Thanks! Let’s build this site’s traffic & make some money! Yes, he is friendly — but even better than that, his communication is great, lets you know exactly what’s going on with your order and when to expect it. Great job. Extremely friendly & very appreciative for the super duper warm welcome! Very Friendly Bonanzler! Has great items as well! !